I´m an English teacher in a small town in Spain. I teach children from 3 to 9 years old and I love it. 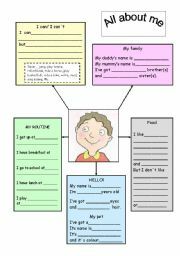 A worksheet for young learners to revise personal information. 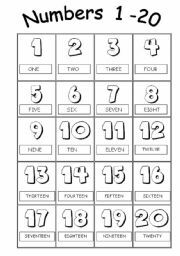 To learn the numbers.You can also cut them to make a set of cards to play. 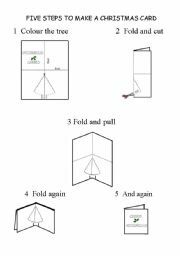 It´s an original Christmas card with a box shape.It´s very easy to make.Cut, decorate, colour, write your message and fold.Your friends will have a nice surprise. 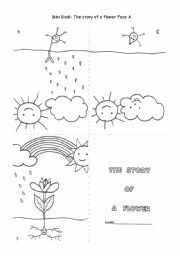 Tell a story.Invent dialogues between the sun,the cloud,the rain, the sleeping seed and the rainbow.Colour the pictures...Enjoy yourshelf! Fold and have a nice surprise.I adapt it from an idea of kizclub page. 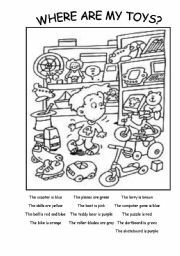 Read and colour the toys to help the boy. 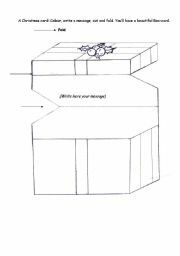 Follow the instructions and make an original Christmas card. The Face : What´s missing? Look at the model and then compare: When children find out the missing part ,they have to draw it and circle the right word. Children have to read the words in the boxes and then write the correct number in each circle.Simple but nice. The numbers are written in letters in order to reinforce the reading comprehension. A short animation that help us to teach Christmas vocabulary,colours and numbers. 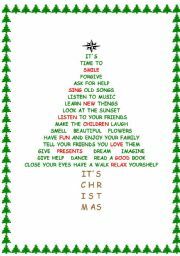 What would happen if you put too many things on the Christmas tree...? But Father Christmas is always ready to help us. Poor snowman, he nedds some help to be happy. 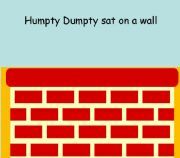 A simple story with funny animations , for children from 3 to 10. They can act out the story after reading it. A nice story about animals... and the role that they´ve got in the chain of life. This is a funny story about a brave pirate and his paper ship. At the end of the story there is a surprise.Children have to make a paper ship and do the same actions that the story shows. Pictures are originals from my sister in law, Carmen Fernández, who is a really good illustrator. 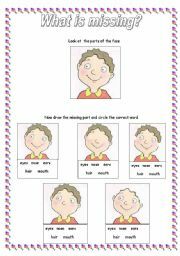 Part 1 It´s useful to present vocabulary about the weather.Children first listen a sound and then they try to guess what´s the weather,they can see a picture and at the end the correct word or sentence appears. Part 2 It´s useful to present vocabulary about the weather.Children first listen a sound and then they try to guess what´s the weather,they can see a picture and at the end the correct word or sentence appears. Children love short animations, here they can read and check if the images match correctly.Sometimes they will discover mistakes but at the end everything is on its place. 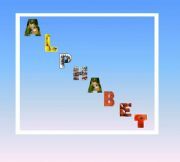 1st part of this funny alphabet: Letters are animated and have an image that represent every sound.